Empress Hotel's crisp décor and high level of service guarantee an easeful stay. The location—a couple of blocks from the restaurants and shops of Prospect Street and the ocean—is perfect for making the most of La Jolla. Guest rooms are modern and stylish, with mini-refrigerators and high-quality mattresses. Ask for a room on a higher floor for a view of the ocean. For unwinding after a long day of work—or surfing—opt for an in-room massage. The Complimentary breakfast is substantial (expect waffles, hard-boiled eggs, fresh pastries, fruit and yogurt) and can be enjoyed on the sundeck. Live piano music always draws a crowd at Manhattan of La Jolla restaurant—and you might be serenaded by a (very good) opera singer on occasional nights. 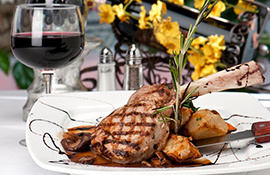 Manhattan of La Jolla serves Italian cuisine in a romantic room. Don't miss live music in the very popular cocktail lounge. A complimentary continental breakfast is served each morning in a breakfast room opening onto the 2nd floor sundeck. Empress Hotel is in downtown La Jolla, walking distance to the ocean and Prospect Street. Torrey Pines Golf Course is about a 15 minute drive from the hotel.